This article has been updated on 1/27/2017 to reflect the latest updates to Tools. Canadian National is another Class I railroad that provides web-based tools for rail shippers and receivers to track their shipments. They package their railcar tracking tools into what is called Tools. You can plan a shipment, get pricing, bill a shipment and pay for a shipment here, but this article focuses on the Monitor Shipments section. If you have been thinking about using CN’s rail shipment tracing tools or you have been using just a small part of it and would like to learn more about what it can do, please read on. To sign up for CN Tools, take a look at this article, which explains how to sign up for most of the Class I railroad track & trace tools. The Quick Trace feature will accept up to 300 railcar IDs. After pasting or entering the IDs, you may save the list with a name of your choice. The output format can be set to several different layouts including two standardized formats that can be used to feed other business systems when the Response Type is set to Spreadsheet. Although the Spreadsheet radio button has a Microsoft Excel icon next to it, it is actually a comma separated values (CSV) formatted file. This is a good thing, since CSV files easily import into business systems and they open and display perfectly in Microsoft Excel. Other Response Types include Browser and PDF. The response will be the last reported location of each railcar in the list. As long as CN is in the route of the current shipment, you will have visibility of the railcar on any railroad. However, if CN is not involved in the current shipment, no data will be returned. How to get there: When you first login to the CN website, it will take you to the Tools Home page. Under the header “Monitor Shipments”, there is a link named “Quick Trace”; click on that link and paste a list of railcars onto the page. There is no feature that enables you to see back farther than the beginning of a current trip, which can be done with the Trip Plans feature (see below). This is a significant exclusion in my opinion. At least 1 month or more of history is needed to dispute demurrage charges, investigate delays, and review service performance. If you agree, you may want to consider a 3rd party system that will store at least 1 year of history of movement data. ETA to final destination for shipments that are moving on another railroad where CN is the terminating carrier. No ETA for a shipment on a shortline and CN is the next carrier in the route, but not final destination carrier. No ETA for a shipment where CN is not the terminating carrier. ETA to interchange point where CN is the originating carrier and another carrier is the terminating carrier. If ETAs to the final destination, regardless of the routing of the shipment, is important to you, consider a commercial shipment tracking system. How to see ETAs: ETAs are shown in the Quick Trace results (see above) and the My Shipments reports if you include the field “ETA” in the view (see Custom Reports section below). There is a field named “Delivery Date” that CN says is known as a committed time of arrival. It is calculated based on historical data from previous trips. I assume that the CN has a statistical model that predicts the date of arrival to the customer’s industry with a high percentage of probability. You cannot see this field on Quick Trace results, you will need to create a custom report on the My Shipments page (see Custom Report section below) and it is a field that is available when you are creating or customizing the View that determines which fields display on the report. There is another field available named “Delivery Difference”, which is the difference between the ETA and Delivery Date. The ETA is generated from the trip plan. For those who are directly served by CN, a new tool has been recently created called iAdvise, which is comprised of the First Mile / Last Mile (FMLM) web tool and 3 email notifications: Temporary Outage Disruption (TOD), Local Service Notification (LSN) and Service Exception Notification (SEN). iAdvise is designed to provide you with information to manage your pipeline. For a very good overview of the tool, go to cniadvise.ca. CN has done an excellent job of providing very easy to understand descriptions of FMLM and the notifications, so I encourage you to go to their site to learn more. I don’t have a facility that is served directly by CN yet, so I don’t have first hand experience to share. Trip Plans may be accessed either by pasting up to 20 railcar IDs onto the Trip Plan page or by clicking the orange icon to the far right of an individual record returned by either a My Shipments report or a Quick Trace report. Usually the estimated events are only the ones that happen on the CN. Sometimes, it will show a start of trip or end of trip event on a carrier other than CN as shown below. How to get there: From the Tools Home page, click on the “Trip Plan” link which is below the Monitor Shipments heading. Or click on the orange icon to the far right of an individual record returned by either a My Shipments report or a Quick Trace report. There are no tools for carload shippers that allow tracing by train ID. My Shipments is the section that enables you to create custom reports that can be scheduled and delivered via email. The tricky thing about this feature is that you really can’t save the report to view at a later time unless you schedule it. But even then, you can’t run the report on demand and you can’t edit the report. You can only alter the schedule and the recipients of the report. There are two things that you can customize that can be saved and re-used. The Traffic List is the basic query that pulls the shipments based on some filters: Shipper, Origin, Destination, Receiver, Products. You can’t create or modify the Traffic List yourself, you can only make a request for how you want to create / modify it. After you submit your request, you will get an email within a day or less telling you that the list has been created / modified. You can create a View, which determines which fields show on the report. You can choose from up to 26 fields. ETA changed in the last [ 8 / 12 / 16 / 24 / 48 / 72 ] hours. You can sort the report by up to two fields that are displayed on the report – with totals or without (same as grouping). Those sorts can be modified after the results are displayed. The response can be displayed in a new browser page, downloaded to a text file (fixed length records), PDF, or spreadsheet (it is actually comma separated values – CSV). How to get there: From the Tools Home page, click on the My Shipments menu. If you schedule the report, then this schedule can be modified or deleted clicking on the My Reports menu from the Tools Home page. After you choose the settings on the My Shipments page (see Custom Report section above), you may click the Schedule Report button, which will take you to the My Reports page. Up to 30 scheduled times may be chosen from a grid that shows 24 hours X 7 week days. You may choose an expiration date for the schedule or choose to keep it running until cancelled. There is a link at the bottom of the page to Update Recipients of the report. How to get there: From the Tools Home page, click on the My Reports menu. When the results are displayed from either a My Shipments custom report or Quick Trace report, you may choose to display the geographical location of a single railcar by clicking on the icon that looks like North America on the far right of the record. Unfortunately, there is no way to show more than one railcar on a map at one time. 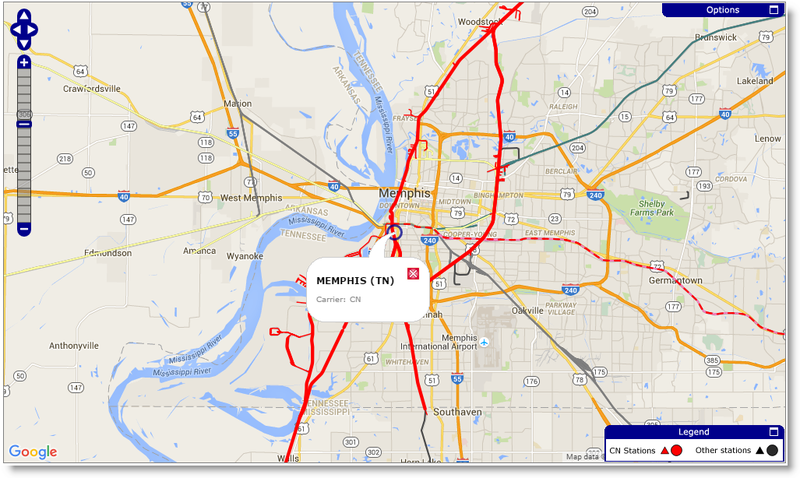 If you really want to see multiple railcars on a map at once, check out a 3rd party shipment tracking solution. There are no ways to see summary reports that show transit time and dwell times in the CN site at this time. This can be beneficial information for negotiating with the railroads, fleet sizing, and identifying bottlenecks in your route network. Most pages displayed quickly. 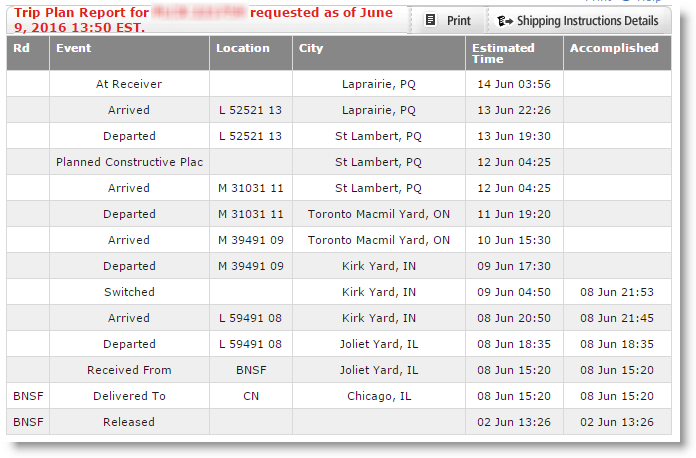 The My Shipments page displays pretty quickly, but the drop down lists on the page take a few seconds to populate. Specifically, the Views and the Sort by lists are delayed and it is a little confusing. The CN website has a modern cohesive design. Each time you open a page, a tab is created for quick and easy navigation back to it. It is the most cohesive interface of all the railroads that I have seen so far (CSX, NS, UP, BNSF). Almost every page has a small question mark icon, which when clicked, reveals very helpful information about the page that you are on. Some challenges: The My Reports menu displays scheduled reports, but those reports can’t be run or modified. The My Shipments page is used to create reports. This was a little confusing to me. Each report must be based on a Traffic List. The creation and modification of the Traffic List is confusing. Once you understand that Traffic Lists are not created or modified by you and that you can only request to create and modify them, things get a bit easier. I hope that you have found this article useful. Please share any experiences, tips, or tricks that you have come up with on the CN tracking tools.